Really fast and backed up by really good support from Trade Scanners. Called them in regard to this product and they liaised with Brother to try to resolve the issue. Would have no hesitation in buying from them again. We're pleased with this unit, which we purchased as a replacment for an old Panasonic unit. The 2700W seems to perform well, and without fuss. The software available for download is up to dateand works well with Windows 10. The scanning speed, over Wifi, is good. The plastic construction is adequate for light to medium usage in an office where people have been trained how to use the device. 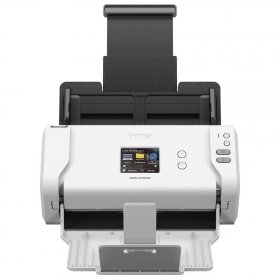 With wireless and wired network, an LCD touchscreen, Windows/Mac compatibility, scan to USB and more, the ADS-2700W is a reliable document scanner at an affordable price.